I'm so glad you like my buttons! Thank you! 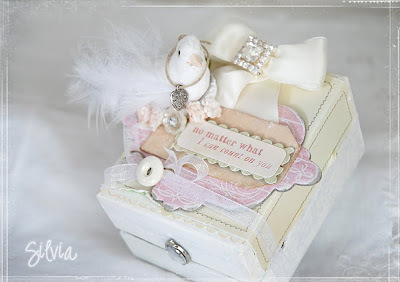 I encourage you to join my blog candy next week. Lots of goodies! So.. stay tuned for a chance to win! Love it!!!! And I just have to say again, I LOVE THOSE BUTTONS!!!! 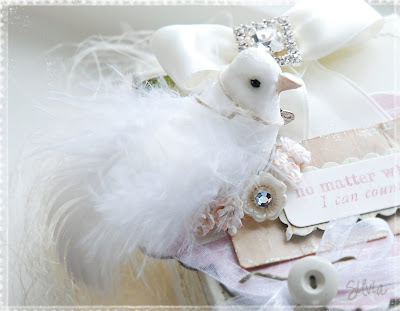 This is adorable love the white bird and the different textures! Am off to find out what all this talk about button is!!lol! OMGoodness this is gorgeous! I am blown away. Wish I could do that. For en lekker boks!!!!! :D LEKKERT pynta, med mye detaljer!! Er det lov å spør hva slags boks det er du har altered?? Og evt hva for noe lurt du har puttet oppi den, som kan være tips for oss andre?? Really Gorgous ! I love it ! Your style is fantastic ! I am happy to have discovered your blog! OJOJOJOJOJ noe så fantastisk vakkert, sukker helt henført her altså!"